Shop the entire KASCO line of bone-in meat cutting blades in our online store! The hardened tooth Large Volume/Heavy-Duty meat cutting band blade offers the strength and durability to stand up to the rigors of high-volume and heavy-duty bone in meat cutting. It has the integrity to consistently deliver straight and sharp cuts over a longer period of time compared to other band blades. 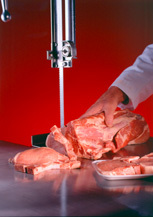 KASCO bone in meat cutting blades are engineered for precision slicing and reliability. 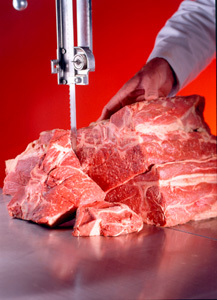 One Way Portion Control band saws are engineered for efficient portion control cutting of fish, beef, pork, and lamb. The controlled set and unique tooth shape cut produce minimum kerf and less waste. These band saws are ideal for an optimum finish on smaller cuts of bone in meat and for standard speed machines. All KASCO one way portion control band saws are engineered for precision slicing and reliability. ** Edge type for all blade sizes above are HPO (Hard tipped, precision ground, one-way tooth style). The Stainless Toothed band saw is exceptionally durable while providing a fast and smooth cut. This bone in meat cutting blade meets the strict sanitation requirements and is NSF Certified. It's made of high quality stainless steel for a longer life and easier cleaning. All KASCO Toothed band blades are engineered for precision slicing and reliability.